is an artist-run initiative formed in 2010 to support experimental contemporary art by providing rental space for projects, exhibitions, events and performance. It aims for a diverse program that emphasises installation and other spatial practices as well as critical and cross-disciplinary work and practices in which ‘idea dictates form’ rather than being medium-based. It aims to foster experimental projects and cross-generational contact, and to support the general arts community through artists’ talks, discussion forums, documentation, archives and publications. Articulate's project space is 108 sq metres — 27m long, 4m wide and 2.5-2.8m high. It is on the ground floor of a renovated warehouse that fronts onto Parramatta Road in Leichhardt. It is accessible from the front and rear of the building. There are stairs on the left after you enter from Parramatta Road, giving access to ArticulateUpstairs and studios on the first floor. Configuration of the project space is shown in the above plan and archival images. For 360-degree panoramas see here and here. 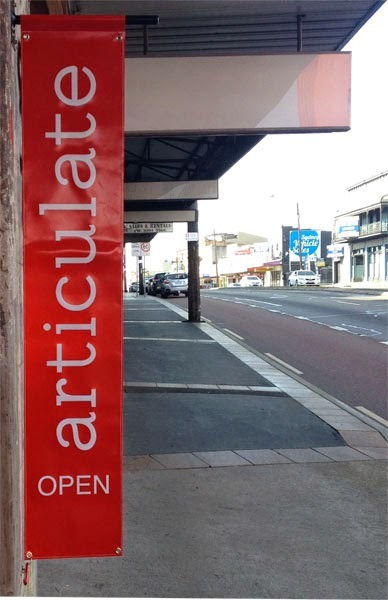 Articulate project space program runs 3-weekly exhibitions in conjunction with the ArticulateUpstairs program. ArticulateUpstairs is a separately run mezzanine space sharing similar concerns. The program can include exhibitions and projects that use both spaces. Standard exhibition opening hours are Friday to Sunday from 11am to 5pm with opening night on Fridays at 6-8pm. Articulate encourages solo, collaborative and group shows as well as developmental and performative projects. It gives greater support to solo/duo installations and projects that use the whole space in acknowledgement of the support and recognition required by this kind of practice. 2. The title of your project/exhibition/program, the names and roles of participants, and 3 preferred time periods. 3. Whether your proposal is for project work (in which you work/perform in the project space most or all of the time), a standard exhibition (with an opening in the first week) a program of events, or an individual proposal (for curating into a group exhibition by Articulate or visiting curator). • images (max 10 individual, 15 group - as jpgs, powerpoint or URL) or equivalent sound or video. Love the idea of 'articulate'. 'Wish I could build giant funnel tubes to other parts of the City, to bring people to your door. Thanks for stocking the NAS 'Summer School' brochures... You changed my life!